I made this pie for Thanksgiving and realized that I forgot to post about it. A shame since it’s a very good pie. But it all works out since Amercian Thanksgiving is coming up in a few weeks and this pie makes a delicious rustic and festive dessert. There’s figs, pears, apples and cranberries stuffed into a pie shell and then topped with a buttery, cinnamon-spiced walnut crumb topping. Maybe because I find double-crusts hard to work with (I can never get a really beautiful looking top crust), I love the ease of a crumb topping pie. Plus, it combines the best of the pie world and the crumble world to create something super amazing. 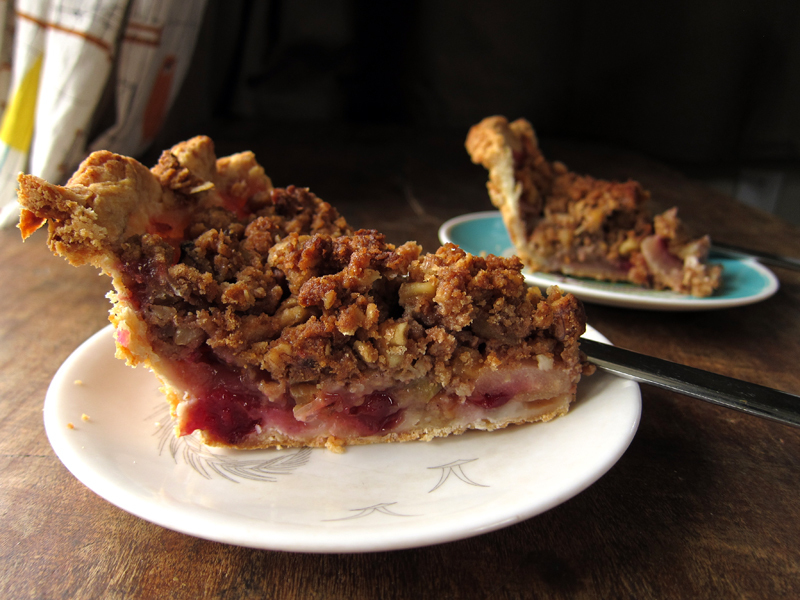 Crumb pies are the best – well, at least I think so. This recipe isn’t a quick one. There’s plenty of steps – all of which are easy enough, but they do require some advance planning. If you’d like to make this for dessert, be aware that the dough requires at least an hour to chill before rolling it out. Then it needs to be chilled again before making the filling and the walnut crumb topping. If you want to get a head start, make the dough the day before. I was able to make this on a hectic Sunday afternoon while checking on the turkey in the oven and making the cranberry sauce, and I didn’t find it too stressful to add on the pie making duties as well. You’ll be attending to the pie process off and on for a couple of hours, but it’s worth every bite. 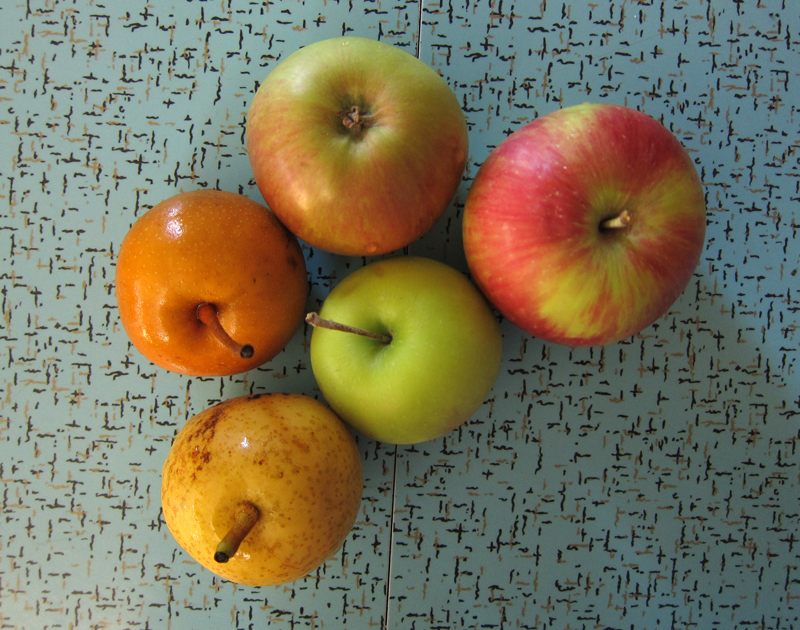 I used a few asian pears that came from our CSA share and several heritage apples that we got from a local farmer. The Wealthy apples I used have a sweet-tart taste but not a whole lot of crunch – they work really well for cooking but not so much for eating out of hand. They were perfect for this pie. Perhaps I’m too traumatized from my childhood as my dad’s Fig Newton cookie stash were often the only sweet snacks in the house, but I don’t usually eat figs. That said, I thought they added pockets of jammy sweetness and a seedy crunch that worked well. And the fresh cranberries were nice bright pops of sour to balance everything out. Top your slice with whipped cream flavoured with maple syrup and cinnamon or a scoop of vanilla ice cream. While the pie is great the same day, I think it tastes even better the next day. For breakfast. With a little yogurt dolloped over top. This recipe was originally a deep-dish pie meant for a 10 inch x 3 inch springform pan. I used my Emile Henry 9-Inch Pie Dish which is 3 1/2″ deep, close enough! If you’d like to go ahead and make a deep dish pie, toss in an extra apple & a pear (or two). Place the flour, sugar, and salt in a bowl and whisk well. Place bowl in the freezer for 10 minutes. Add butter to the mixture and toss to coat, using a pastry blender or a food processor to blend until the mixture resembles coarse crumbs and the butter is about the size of peas. Stir the water and the lemon juice together and then pour over the dry ingredients until just moistened. The original recipe called for 3 tablespoons of water, but I had to use 6 to get it lightly moist. Dump the dough onto a floured work surface and press into a 6 inch disc. Wrap tightly in plastic and chill in the fridge for at least an hour or overnight. Roll into a 14″ disc and line your pie plate with the dough, patching any tears if need be and trimming the sides. I had a bit of dough scraps left over which I tossed but you could easily brush them with butter & sprinkle with cinnamon & sugar for a little snack (my mom did this when we were kids & I loved these little bites). Chill for another 30 minutes while you prepare the topping and filling. Boil the figs in a cup of water for 5 minutes, drain well & roughly chop. Put the figs, along with the rest of the fruit into a large bowl. Toss with the sugar, spices and cornstarch. Set aside. Mix the crumb topping ingredients together in a bowl and use your hands to work the butter into the rest of the ingredients to create a coarse crumb. Set aside. Remove the pie dough from the fridge and pour in the fruit filling. Top with the crumb topping. Bake in the lower third of the oven for 60 minutes or until the crumb is golden and the fruit is bubbling thickly around the edges. If the crumb or the crust is becoming too dark, cover with foil. Let cool slightly and serve with ice cream or whipped cream. it’s the crumb that makes it just right. Would you believe I’ve never made a crumb-topping pie? Truth be told, Thanksgiving is probably the only time of year I actually make pie, but it really should be something I bake more often. The collection of fruits + the crumb topping sounds really fantastic. Yum! I haven’t made pie in so long. I should make it more often as it gives me an excuse to eat more whip cream. Making a double crust is really not that difficult once you get the hang of it. 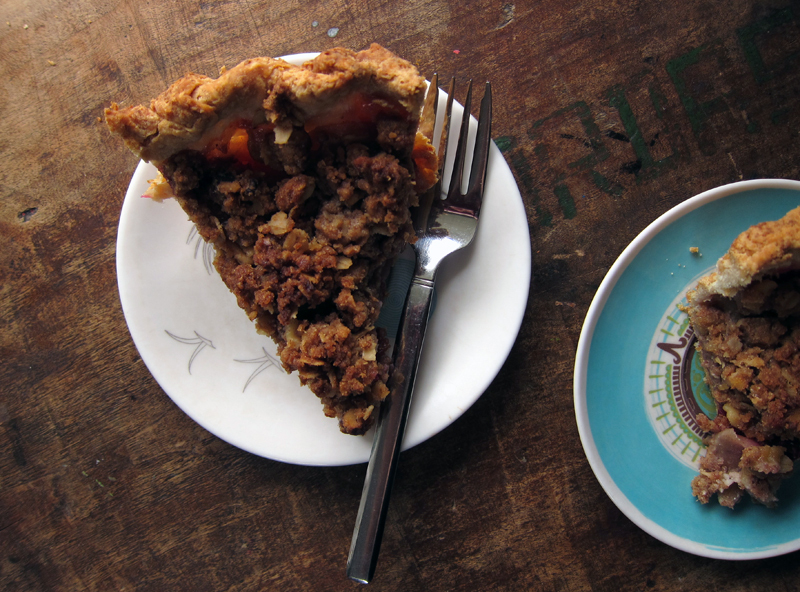 That being said, a walnut crumble crust ranks high points in my book for being nutty delicious! Eileen, it was such a good seasonal pie for thanksgiving – we all loved it. Haha, yes, more excuses to make whipped cream, Bijoux. I know, practice makes perfect – I guess I should start making more pies?! I was holding this cookbook in a museum shop just yesterday. Love it when someone takes a recipe for a spin and I can hop on for the ride. How pleased am I that I bought walnuts, pears and apples today? I left the cranberries behind at the market, but I’ll make sure to run out and pick some up. All these fall fruits in one delicious place…I love it! 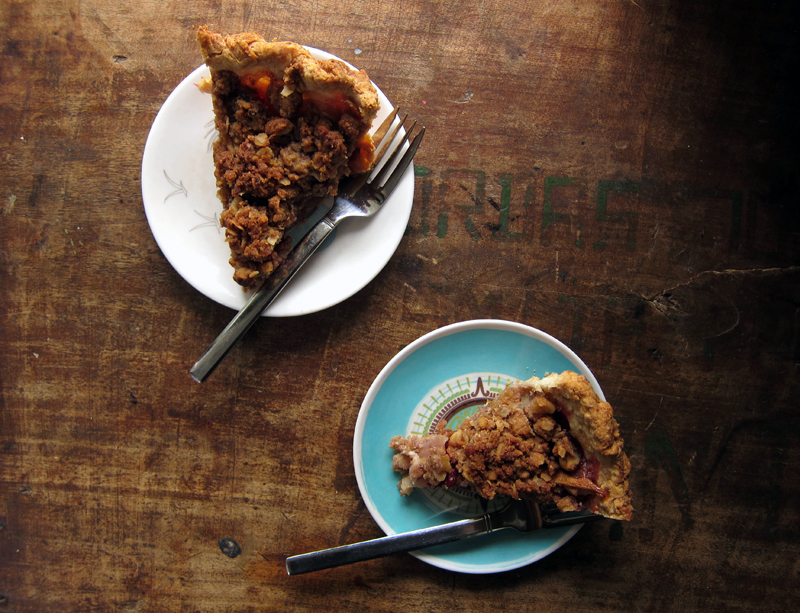 And I agree…the crumble/pie combo is really the best of both worlds. This looks delicious! I will try it since I always make an apple pie for my pumpkin-hating hubby. I love living close enough to Canada to enjoy TWO Thanksgivings a year. Molly, it’s a beautiful book – I’d put it on your xmas list for sure! I hope you love the pie, it’s a good one. Yay, I’m so glad you agree, Joanne. I knew we had much in common, Nicole 🙂 More pie always wins out over double crusts! Love it. Piper, you celebrate twice? Nice!! Hi! !I made these pie last Sunday. It was a huge hit! I changed some ingredients and I added others, you can see it in my blog if you want! Macus, so glad you loved the pie – your photos look gorgeous!! And I love that you went deep dish! Hooray! !